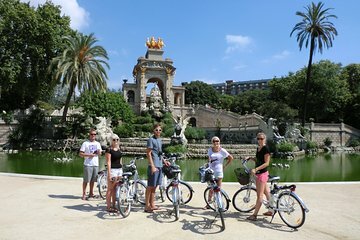 Explore the five most distinctive neighborhoods in Barcelona on this half day e-bike adventure. Easily cruise through the city’s cycle-friendly streets, and scale the surrounding hillsides for panoramic views of the metropolis and sea as you discover the most interesting landmarks of the Gràcia, Raval, Gòtic, Eixample, and Barceloneta districts. The urban landscape of Barcelona is characterized by distinctive neighborhoods, each with its own unique mood and history. Meet your local guide in the centrally located Plaça Reial, and climb aboard a quality electric bike equipped with an eco-friendly battery. Get a brief lesson in operating the e-bike if you've never ridden one, and set off through the city's many bike-friendly paths that allow you to move safely and comfortably alongside traffic. Follow your guide on a carefully planned itinerary that leads through the five major neighborhoods of Gràcia, Raval, Gòtic, Eixample and Barceloneta. Watch scenes of daily life in the Gràcia, admire modernist masterpieces in Eixample, soak up the bohemian charm of the Raval, and explore the winding streets of the Gothic Quarter, home to Antoni Gaudí’s famous Sagrada Familia Cathedral and Casa Batlló. Pedal along the beachfront promenades of Barceloneta, where you can take in the fresh sea air and see where locals go to relax and catch some sun and waves. Enjoy the flexibility of a bike tour that allows you to stop often for photos and soak up the local atmosphere, and listen as your guide provides insightful commentary on each area’s history and modern attractions.